DETAILS FOR Open MIC set to host the Penn State Music Awards on February 26th! Open MIC set to host the Penn State Music Awards on February 26th! 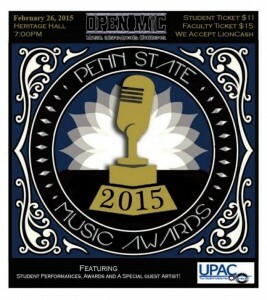 Comments Off on Open MIC set to host the Penn State Music Awards on February 26th! Yes–The Grammy’s Are Finally Coming To Penn State! The Penn State Music Awards are coming! This is an awards show put on by Penn State’s Open Music Inspirations and Concepts (Open MIC). They will be having rounds of nominations for possible candidates to be nominated for a variety of categories. For example, “Best Male/Female Poet At Penn State”, “Best D.J. At Penn State”, “Best Dance Group At Penn State”, “Best Rapper At Penn State”, “Best Acapella Performance at Penn State” and many more. After the winners in each category have been determined they will receive their “golden mic” at the event. After awarding the winners, we will have several student/guest performances. Following that, “OCD: Moosh & Twist” will be performing, and opening for them is “Ground Up”. “OCD: Moosh & Twist” will be going on their “Patiently Waiting Tour” and Penn State is just one stop among many for them. They will be traveling and performing in many places, such as New York, Kentucky, Pittsburgh, Texas, and Canada just to name a few. The group consists of two young male artists, DeQuincy “Moosh” Coleman McRae and Oliver “Twist” Feighan. The two bonded over their love of music in first grade and have worked together to become the successful hip-hop artists that they are today! They have over 12 million Youtube views and over 100,000 mixtape downloads. “Living Out Loud”, their first EP, was ranked in the top 5 on the iTunes Hip-Hop charts and was ranked #1 on Billboard Magazine’s Heatseeker’s list. The two 21 year olds have opened for artists such as, The White Panda, Hoodie Allen, and Wale. Moreover, the Penn State Music Awards will allow groups and organizations to be recognized for their talents who may not have been otherwise. And it also provides an affordable concert for students and others in a convenient location! Tickets will cost only $11 for PSU students and $15 for PSU faculty/staff, general public and children/youth. The event will take place on Thursday, February 26, 2015 in Heritage Hall at the HUB at 7:00PM! This is a cannot miss event, and Open MIC looks forward to seeing you there! Do you know a talented Penn Stater? Well you are in luck! Open Mic is currently accepting nominations for various cateegories. To nominate a musical act or group, click here.